Gibraltar ( /dʒɨˈbrɒltər/) is a Breetish owerseas territory locatit on the soothren end o the Iberie Peninsulae at the entrance o the Mediterranean. 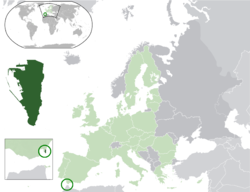 It haes an aurie o 6.8 square kilometres (2.6 sq mi) an a northren border wi Andalusie, Spain. The Rock o Gibraltar is the major landmark o the region. At its fuit is the densely populatit ceety aurie, hame tae amaist 30,000 Gibraltarians an ither naitionalities. An Anglo-Dutch force captured Gibraltar frae Spain in 1704 durin the War o the Spainyie Succession. The territory wis subsequently cedit tae Breetain "in perpetuity" unner the Treaty o Utrecht in 1713. It wis an important base for the Ryal Navy; the day its economy is based lairgely on tourism, financial services, an shippin. The sovereignty o Gibraltar is a major point o contention in Anglo-Spainyie relations as Spain asserts a claim tae the territory. Gibraltarians rejectit proposals for Spainyie sovereignty in a 1967 referendum an again in 2002. Unner the Gibraltar constitution o 2006, Gibraltar govrens its awn affairs, though some pouers, such as defence an foreign relations, remain the responsibility o the UK Govrenment. 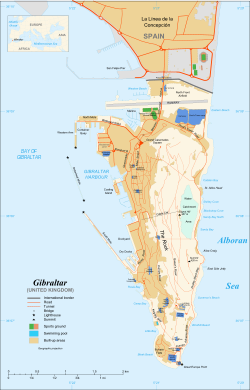 The name Gibraltar is the Spainyie derivation o the Arabic name Jabal-ı Tārık (جبل طارق), meanin "muntain o Tariq." It refers tae the geological formation, the Rock o Gibraltar, which in turn wis namit efter the Berber Umayyad general Tariq ibn-Ziyad who led the initial incursion intae Iberie in advance o the main Moorish force in 711 unner the command o Umayyad Caliph Al-Walid I. Earlier, it wis kent as Mons Calpe, one of the Pillars of Hercules. The day, Gibraltar is colloquially referred tae as Gib or the Rock. ↑ "Abstract of Statistics 2009, Statistics Office of the Government of Gibraltar" (PDF). p. 2. The civilian population includes Gibraltarian residents, other British residents (including the wives and families of UK-based servicemen, but not the servicemen themselves) and non-British residents. Visitors and transients are not included. In 2009, this broke down into 23,907 native born, 3,129 UK British, 2,395 Other for a total population of 29,431. On census night there were 31,623 people present in Gibraltar. This page wis hintmaist chynged oan 05:57, 25 August 2015.